With so many players making a move yesterday it is hard to choose one. Jordan Spieth finds himself just 4 shots off the lead after a 3 under, 69 which puts him right back in contention heading into the weekend. Sergio Garcia opened up with 3 birdies on the first 3 holes and now he finds himself in a 4 way tie for the lead alongside first round leader Charley Hoffman, Belgium, Thomas Pieters and Rickie Fowler. Rickie is my player of the day as after a double bogey to leave him with a opening ground 73 it would have been very easy for him to come out on FRiday and give shots to the course. However, he did just the opposite and opened up with an eagle on the 2nd hole and after a bogey on the 15th he folllowed up with a birdie on the difficult 16 and with 2 pars on the 17th and 18th he carded a second round 67, in what once again were difficult conditions. The biggest shock of the tournament can often come on the Friday as players get cut from the weekend. Danny Willet is our biggest surprise as the defending champion finished the day on 7 over par leaving him one shot above the cut line. The Yorkshireman opened up with an 8 on the first hole and from then on he always appeared to be fighting a losing cause to play the weekend. Tyrrell Hatton is also amongst the names not to play this weekend after a first 80 left him with just too much work to do in difficult conditions. Shocking us for a good reason is 57 year old Fred Couples who finds himself just 3 shots off the lead. The shot of the round came early on from William McGirt on the long par 3, 4th hole. 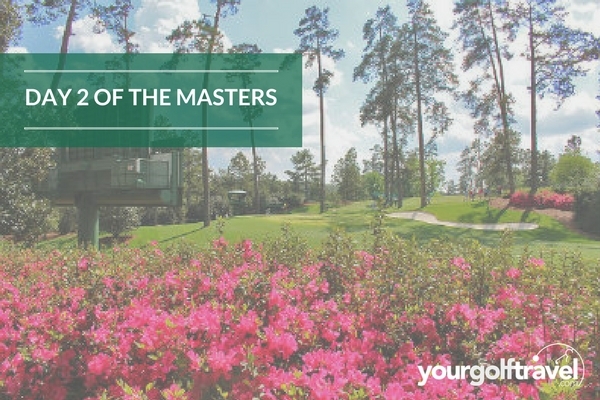 After coming up short in the bunker, the Masters debutant had a tricky shot to make up and down. However, he showed knowledge of the course that only Masters veterans have an produced a stunning bunker shot flying it 20 feet past the hole and letting it roll back in for a birdie 2. An incredible shot for someone who is only playing in his 2nd round at Augusta National. We also have a celebrity spot from day 2 of The Masters. I believe I saw TV show host Jeremy Kyle is at Augusta National. Jeremy is a big fan of golf and plays regularly at his home club Wentworth so it comes as no surprise to see him at golf’s biggest event.